A new exhibition at Windsor Castle provides a rare glimpse into the world of royal weddings ... intimate occasions that have become spectacularly public events in recent years. "Royal Weddings, 1840-1947" runs through 11 May 2008 in the Drawings Gallery. It tells the stories of five royal weddings – from the marriage of Queen Victoria and Prince Albert to the wedding of Princess Elizabeth and Lieutenant Philip Mountbatten – through photographs, documents from the Royal Archives, rare memorabilia, and charming personal gifts exchanged by members of the Royal Family. 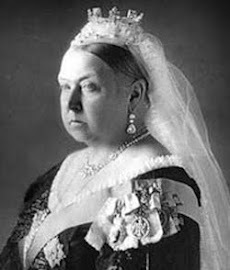 In her journal, Victoria describes her joy when Albert agrees to marry her, saying how happy she is to "feel I was loved and am loved by such an angel." For her engagement in 1839, she received a beautiful gold bracelet with conjoined amethyst hearts from her mother, the Duchess of Kent, and "a lovely brooch, a spray of orange flowers" designed by the Prince. 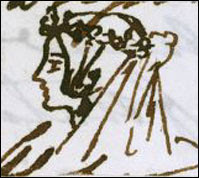 A sketch by Queen Victoria of how she imagined she would look in her wedding veil (shown here) is among the memorabilia on display. It was doodled by the young queen as she planned her wedding to Albert, a man she described as "excessively handsome," with "such beautiful blue eyes, and exquisite nose, and such a pretty mouth with delicate moustachios and slight but very slight whiskers." 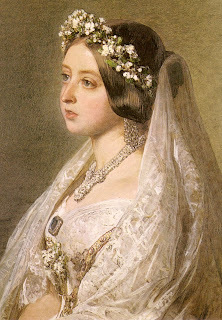 At the wedding ceremony on 10 February 1840, Victoria was attended by twelve train-bearers, all daughters of peers of the realm. Each girl received a gold brooch, designed by Prince Albert, in the form of an eagle and set with turquoise, pearls, rubies, and diamonds. The queen designed their dresses and recorded in her diary her first sight of the bridesmaids "dressed all in white with white roses, which had a beautiful effect." Two pieces of the couple's wedding cake are included in the exhibition. 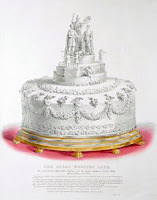 John Mauditt, Queen Victoria’s confectioner at Buckingham Palace, made the cake shown here. It was on a vast scale, measuring three metres in circumference and weighing more than 140 kg. The allegorical figure of Britannia stands at the top blessing the symbolic figures of the bride and groom. On top of the cake were bouquets of white flowers tied with true-lovers-knots of white satin ribbon intended as presents for the guests at the wedding breakfast. The exhibition also details the 1863 wedding of the Prince of Wales (the future King Edward VII) and Princess Alexandra of Denmark, the 1893 wedding of Princess Victoria Mary of Teck (the future Queen Mary) to Prince George of Wales (the future King George V); the 1923 wedding of the Duke of York (the future King George VI) and Lady Elizabeth Bowes Lyon (the future Queen Elizabeth, the Queen Mother); and the 1947 wedding of Princess Elizabeth (the future Queen Elizabeth II) and Lieutenant Philip Mountbatten (the future Duke of Edinburgh). Royal librarian Jane Roberts says the display shows "how the Royal family really had the same sort of views about marriage and love and weddings as the rest of us." The exhibition was mounted in celebration of the upcoming 60th wedding anniversary of Queen Elizabeth II and Prince Philip. Some reports say that Elizabeth will bestow the title of Prince Consort on her husband later this year. If those reports are true, he will join Prince Albert as one of only two prince consorts in British history. An excellent online version of the exhibition is available here. The exhibition is accompanied by the book Five Gold Rings: A Royal Wedding Souvenir Album, which is richly illustrated with images of wedding dresses and jewelry, gifts between bride and groom, engagement and wedding presents from friends and family, wedding cakes and flowers, invitations, menus, music, and photographs. Woven through the text are personal letters and diary entries from the Royal Archives, several of which are reproduced for the first time. 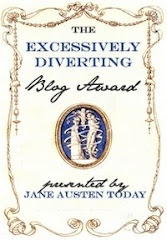 It can be ordered for £9.99 from the Royal Collection online shop.